This special tour offers you many different things a classic adventure itinerary doesn’t have. 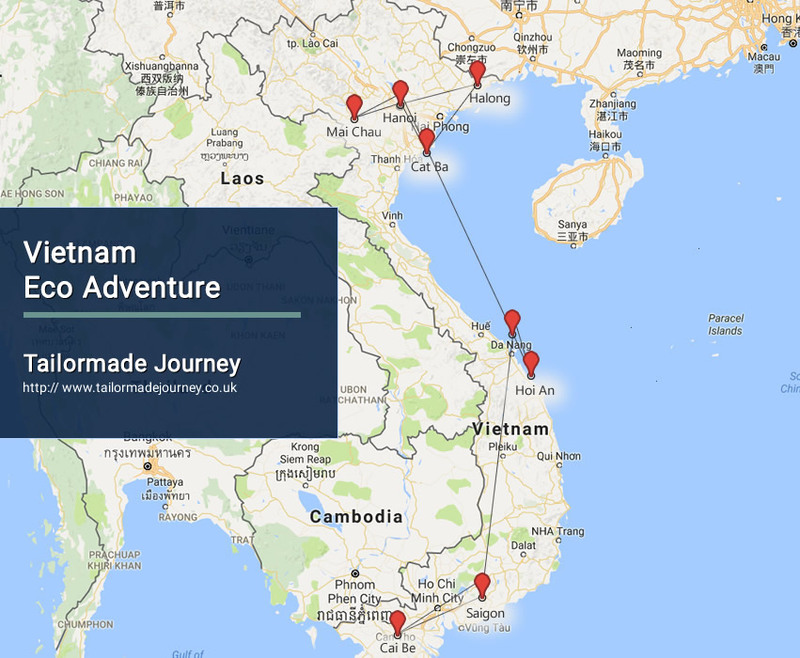 Experience different aspects of Vietnam culture and daily life with many things learnt from local people, act as a local and experience in the same way the locals do. Morning city tour starting with the Ho Chi Minh Complex, including the mausoleum of the nation’s founder Ho Chi Minh (closed every Monday), the Ho Chi Minh stiled-house, Ba Dinh historical square where Ho Chi Minh declared the Independence of Vietnam on 2 Sep 1945. Visit Vietnam museum of ethnology, one of Top 25 museums of Asia listed by TripAdvisor, dedicated to Vietnam’s 54 ethnic groups, which brings you a good overview at Vietnam diversified cultures and traditions. After lunch, you’re privately transferred to Halong city through the Red river delta. On the way, we may stop enroute to admire the local rice fields. Arrive at Halong hotel in the late afternoon and overnight in Halong. After breakfast, you’re transferred to Bai Chay tourist wharf, boarding a private day boat sailing around Halong Bay, UNESCO World Heritage with thousands of limetstone and small islets. Visit Ba Hang, 1 of the 4 famous fishing villages of the bay. This is home to about 80 households living offshore. You will try kayaking around the village with stops to visit a family and the floating school. Kayaking among the hidden areas of the bay, around the Burning Incence rock islet, the symbol of Halong bay. Back to the boat for a typical Vietnamese lunch with “Nem” Vietnamese spring-rolls and seafood. Relax or snap photos as the boat crosses the most beautiful part of the Bay. Disembark in Gia Luan harbour, North pole of Cat Ba islands. Private transfer with our tour guide to Ang Soi intersection in the edge of Cat Ba National Park. Take over the bike and start easy-cycling from Ang Soi to Xuan Dam village along the mountain side and small beaches. You also passing through the damps where locals raise-up shrimp, fish and crabs. End of the cycle inside Xuan Dam village (total 6km cycling). Check in Cat Ba Eco-lodge (formerly named “Suoi Goi Eco-lodge”) inside Xuan Dam village. Dinner is pre-arranged in the Eco-lodge because there aren’t restaurants in the village. Overnight in Cat Ba Eco-lodge. Start your day with a jogging through the rice fields of Xuan Dam village to enjoy the fresh atmosphere of a new day in the countryside. After breakfast, you will take part in farming acvities with the locals. You will learn how to plant trees and vegetables in the garden of Eco-lodge or in the rice fields of Xuan Dam village. During the harvest months of May – June or September, you also help the locals cut the rice trees in the rice fields. It’s time for you to act as a local. Morning check out at 10:00 then private drive uphills to Mai Chau valley, home to White Thai hilltribe on the Northwest mountain range. Enroute stops on Thung Khe and Thung Nhuoi pass to take photos of the Mai Chau town below. Only 140km from Hanoi, the valley is where you can find out everything about the traditions of White Thai ethnic people. Arrive at Lac village or Pom Coong village in the afternoon. Check in a local stilt-house of White Thai. Say hello to the host and relaxation. Dinner with traditional food of White Thai hilltribe then join the dancing and singing show performed by villagers. Overnight in Mai Chau (homestay – dorm room). Morning trekking among the traditional stilt-houses, lush rice fields, streams, bamboo trees and mountains. Our tour guide will tell you more about the customs, embroidery and architecture of White Thai people. You’re freely talking to the locals. Lunch then saying goodbye to the family. Depart for Hanoi airport and you take the short flight to Da Nang. Guide pick guests up at hotel, take bicycles along De Vong River to Cam An wharf. Embark on the boat to Cua Dai sand dune, enjoy casting net show and learn how to cast net by local fisher man. Continue to Cam Thanh Water coconut village, have a brief introduce to the history there. Take on the basket boat along the water coconut river. Fisherman will teach you how to catch the crabs (02 paxs/ boat). Divide our group into 2 teams for basket boat racing and catching crabs. There will be a lovely present for winner. Embark on the boat, enjoy the folk songs show by local people and learn how to make funny tools by water coconut leaf. Then get on board to Cam An wharf, continue to take a bicycle to Tra Que village and join in the daily activities with local farmer there. Enjoy special local food such as pancake, Tam Huu spring roll, fried fish … in Tra Que herb village. Morning walk to visit the ancient architecture of Hoi An – known as a fascinating combination of Vietnamese traditional characters with Chinese and Japanese influence.There are plenty to see in this delightful town, some of which are the famous Japanese Covered Bridges, the Pottery Museum, the 200 years old Tamky House, the Chua Ong Pagoda, the vibrant market. Return to your hotel to check out then private transfer to Da Nang airport for the onwards flight to Saigon, the entertainment center of Vietnam. Breakfast at hotel. Excursion to Mekong Delta. Upon arrival at Cai Be, you embark a private boat to cruise along criss-cross canals on Mekong river. Visit local garden and house to see orchard, rice crisped producing process. Continue taking a cruise along river to see peaceful tranquil life of villagers, admire marvelous natural setting of Mekong Delta region. About 3 pm, the boat will arrive at Vinh Long Market, walking around to explore Vinh Long Market. Then transfer to a homestay in Vinh Long province. Take a leisurely boat trip to explore the picturesque tributaries of the Lower Mekong river (Bassac River), then proceed to visit Cai Rang floating market (& Phong Dien is optional), which are the liveliest in the whole religion. Today you are transferred to Saigon (Ho Chi Minh) Airport to board flight for Onward Journey. I wrote this recommendation of your work that you can include on your profile. My daughter and I enjoyed a memorable holiday guided by your excellent knowledge of Sri Lanka. Your company was both enjoyable as well as educational. I hope to book with you again and highly recommend you to anyone who is planning to travel.